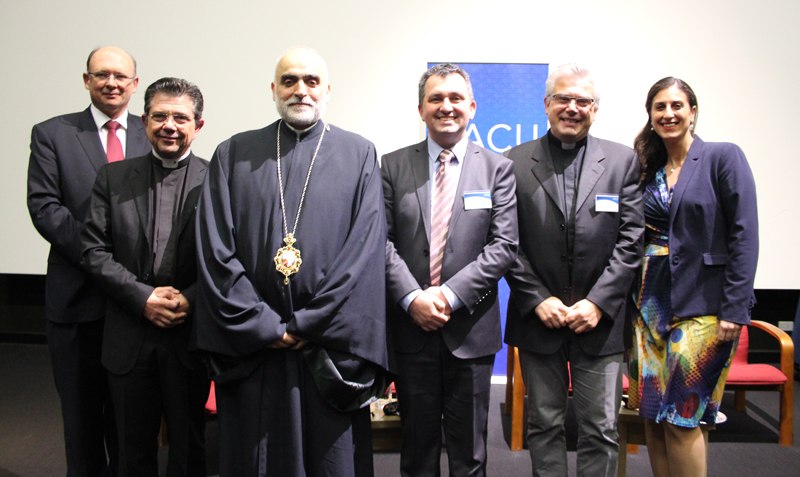 The sixth annual Bishop Joe Grech Memorial Colloquium has been held in Melbourne, at Australian Catholic University. This year, the Australian Migrant and Refugee Office (ACMRO) convened the Colloquium, in association with ACU. Father Maurizio Pettena, Director of the ACMRO, introduced the speakers, His Eminence Bishop Robert Rabbat, the Eparch of the Melkite Greek Catholic Church of Australia and New Zealand, Mr Bayram Aktepe, President of the Islamic Council of Victoria, and Scalabrian priest Father Fabbio Baggio, a dean and professor at the Pontifical University in Rome. The theme for the 2016 Colloquium was ‘Ethics and Migration’, with the topic, ‘Christian-Muslim relations in a persecuted region and the impact on immigration.’ In his introductory remarks, Father Pettena reminded the audience that this week is the week leading up to the 102nd World Day for Migrants and Refugees on Sunday 28 August. Pope Francis has chosen the theme for this year’s World Day: ‘migrants and refugees challenge us – the response of the gospel of mercy’. Justice without mercy, says Pope Francis, does not constitute true and lasting justice. Father Maurizio Pettena, Bishop Robert Rabbat, Mr Bayram Aktepe, Father Fabbio Baggio and Fiona Basile. Father Pettena drew from an earlier message of Pope Francis, who said, ‘as Christ on the road to Emmaus, the Church wishes to make herself the companion on the road of every man and woman’. But, he asked, faced with these fundamental challenges of conflict, suffering, persecution, forced exile, endless waves of refugee camps and death, is Christian-Muslim dialogue possible and effective, or is it merely an academic exercise with no practical relevance? It is, however, a source of great hope when we experience or hear of Christians and Muslims joining hands to help the needy. Fr Pettena having set the scene, Melbourne’s Catholic journalist and photographer Fiona Basile, the facilitator and moderator for the evening, introduced Bishop Robert Rabbat to the Colloquium. Bishop Rabbat spoke about the life of the Church in the Middle East, especially for Christians in Syria under intense pressure from the conflict there, and also their lives in countries such as Lebanon and Jordan, where many refugees from Syria and Iraq have been taken in. The bishop pointed out that under present day media reportage of Middle Eastern conflict, our judgement is coloured by a ‘one size fits all’ approach, where parties engaged in conflicts are summarily divided into three groups, Sunni, Shiite and Kurd, without regard to the reality of the true ethnicity, and religious and political affiliation of the peoples involved. We also need to be aware, he said, of the use of the word ‘minority’ in the media. Christians, for example, are referred to in that way, a way which ignores the fact that Christianity pre-dates Islam in all of these regions. Additionally, the word tends to become a pejorative, reinforcing the status of Christians in those countries as second class citizens. The scale of migration is staggering, said Bishop Rabbat. Seven million refugees have fled Syria, mostly into Lebanon, Jordan and Turkey. The population of Lebanon, a modest four million, has suddenly swollen to six million. 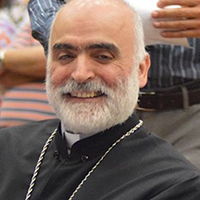 A little known fact about Lebanon, shared by the bishop, who has spent many years of his ministry there, is that the President of Lebanon is a Christian, the Prime Minister is a Sunni Muslim, the President of the Houses of Parliament is a Shiite. It is the only nation on earth where the feast of the Annunciation of the Blessed Virgin Mary is a national holiday. In Lebanon, in fact, you can pray, you can gather to worship, you can build a church without having to get a government permit! There is hope. The war in Syria is not against Christians, he pointed out, but Christians have paid a high price because of it. And it is also a reality, a tragic one but a reality nevertheless, that most Muslims in the Arab world regard Christians as leftovers from the Crusades. Bishop Rabbat concluded by pointing out that, more than at any other time in history, war and its consequences touch every member of society in an immediate and compelling way. The horrors of warfare used to be merely sanitised on the canvases of great painters. Now its brutality is thrust into our homes at each newscast. Bishop Rabbat was followed by Mr Bayram Aktepe, president of the Islamic Council of Victoria, who spoke from the viewpoint of a ‘moderate’ Muslim, a descriptive he said he was a little concerned to accept, since it implied the reality of Muslims who were less-than-moderate. In offering a Muslim perspective on the Middle East, Mr Aktepe, who has spent much time in the nation of Qatar, reminded his listeners that political and religious outlooks vary so widely from country to country in the Middle East. There are two religious models in the landscape of the Middle East, he stated. ‘Producer’ countries like Saudi Arabia, Iran, Turkey and Egypt, influential and exerting pressure on their neighbours, and ‘consumer’ countries like Jordan, Lebanon, even Muslim India. Despite the differences of approach and methodology, however, the Middle East is marked by a real sense of Arab unity, common to most Arab countries. The so-called Arab Spring uprising of 2010, which started in Tunisia and spread throughout the Arab world, has been derailed, to a very large extent, by the withdrawal of support for Syria in the Arab world. Mr Aktepe explained that process of disintegration, as support for the uprising, originally high amongst the Arab monarchy nations, was withdrawn after events in Syria made monarchs realise that their own power and structure were potentially at risk. They stopped supporting the Syrians and their determination to get rid of their leadership. We are still seeing the repercussions of that today, stated Mr Aktepe. Despite the political turmoil amongst Arab countries, Mr Aktepe was at pains to point out that a highly prevalent attitude amongst them that still exists today is that America still appears as the common enemy. ‘They’re out to get us’, ‘they don’t want a stable Middle East’, ‘they don’t want us to be united’ are the commonly held feelings amidst the Arab world. As well, America’s prevalent bias against Palestine is another sticking point. Many countries in the Arab community, explained Mr Aktepe, feel very much that they are being meddled with, that outsiders (the west) are coming into their world and disrupting it, interfering with it. The prevailing sense of unfairness and injustice leads also to political vacuums, with their potential for further conflict. Bayram Aktepe was followed by Doctor Father Fabio Baggio, presently director of the Scalabrinian International Migration Institute in Rome. Father Baggio offered the gathering a reflection on the migration crisis as it applies particularly to Europe, in light of the present massive conflict-driven migration to EU countries, where the impact since 2012 of the Syrian civil war has been felt so keenly. Fr Baggio presented the grim statistic that, last year in 2015, there were 65.3 million forcibly displaced people worldwide. Basically, he added, there are just 15 conflicts producing all these displacements. The three nations from which over 50% of these displaced people are coming, as it affects Europe, are Syria, Afghanistan and Somalia. And the upsurge in numbers is staggering. In 2012 there were 332,000 applications for asylum in European Union countries. In 2015, it was 1.3 million. Presently, reported Fr Baggio, only Germany and Italy retain their open-door policy. Austria, Hungary and the Netherlands have closed their borders, while limited entries are still being permitted in Macedonia, Serbia, Croatia and Slovenia. Sweden too has tightened its borders. Human suffering, said Fr Baggio, must be addressed wherever it is found and paid attention to wherever the most vulnerable are to be found. The Colloquium concluded with moderator Fiona Basile accepting questions from the floor for a hearty Q and A session, which culminated in Bishop Robert Rabbat making the remark, given the multitudinous nature of the problems facing us all, and the urgent matters pressing in on us from all sides, to ensure that each one of us creates the personal space in which to balance competing needs. Photos by Peter Byrne, Media and Communications Office, Archdiocese of Melbourne. This entry was posted in ACBC agency news, Bishops and tagged ACMRO Colloquium, Bishop Robert Rabbat, Christian-Muslim Relations, Migrants & Refugees on August 30, 2016 by ACBC Communications.